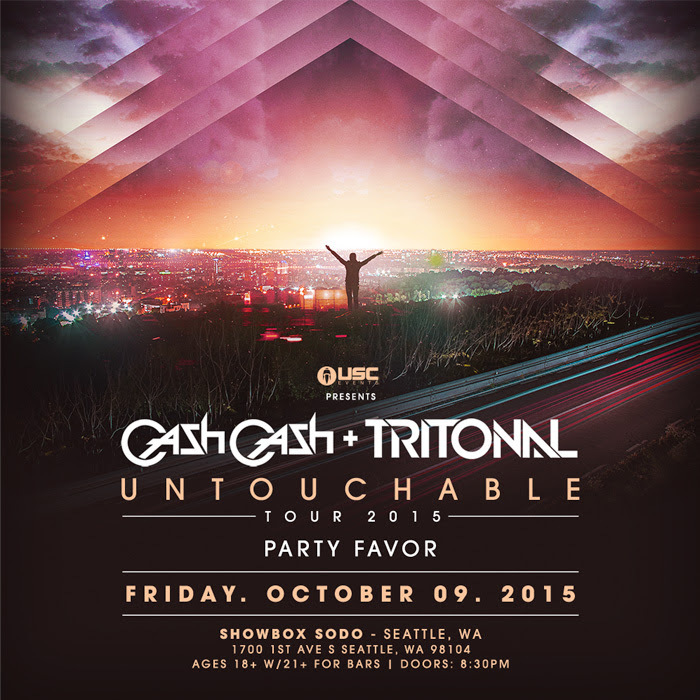 Tritonal and Cash Cash present the Untouchable Tour with Party Favor on Friday, October 9th 2015 at the Showbox Sodo! Two of dance music’s rising favorites Cash Cash and Tritonal raise the bar on touring, announcing an incredible three-month joint “Untouchable Tour” across the length and breadth of North America. After their collaboration “Untouchable” scaled the heights of the iTunes and Beatport charts last month, it should come as no surprise to fans and industry insiders alike that the two groups have chosen now to join forces. Both have made serious in-roads establishing themselves as frontrunners in the new generation of homegrown talent and both have scored multiple hit records – Tritonal with an impressive three Billboard Top 10 Dance Chart hits to their name in only the past 12 months while Cash Cash clocked up over 48 million Spotify streams and 15 million YouTube views for hit single “Take Me Home” ft. Bebe Rexha. Don’t forget to stay up to date on local EDM events happening in Seattle by following the EmeraldCityEDM Upcoming Event Calendar and enter to win FREE local show tickets on our Giveaways page. Recently earning a spot on MTV Clubland’s “10 Artists to Watch in 2013″ list and landing at #65 on DJ Mag’s Top 100 DJs of 2012, Tritonal continue to launch track after track on to the Beatport charts and ignite dance floors around the world with their energetic and unforgettable sets. Their debut artist album “Piercing the Quiet” produced eight top 20 Beatport singles, including five that held the #1 position on the trance chart for weeks at a time. In September 2012, they released the follow-up “Piercing The Quiet Remixed,” which landed in the top 5 on the iTunes dance albums chart. Such a rapid ascent into the forefront of an ever-changing dance music industry might intimidate even the most seasoned professionals, but the duo who “complete each other’s musical sentences” have captured the hearts and ears of fans and DJs alike. In 2012, Tritonal stood out on the festival circuit, winning over legions of fans at massive gatherings such as Electric Daisy Carnival, Escape From Wonderland, Ultra Music Festival, A State of Trance 550, and Creamfields Australia. They also managed to find time to release nine new tracks through their record label, Air Up There Recordings, sell out legendary clubs such as Exchange LA and Space Miami and syndicate their popular Air Up There radio show throughout five continents. After 100 episodes of the show, Tritonal ended Air Up There with a sold out, live performance in their hometown of Austin, Texas. A new program called Tritonia will commence in 2013 and will be syndicated on Sirius XM’s Electric Area. With a fan base of dedicated Tritonians expanding rapidly around the world and a truly memorable, vivacious stage presence which must be seen to be believed, Tritonal continue to shower music lovers with their uplifting, original material and brilliant remixes of some of the best dance music today. We will post the link as soon as it is online. No ETA yet. ATTENTION DJS! WIN your way in to this sold out show by entering & winning the Future Sound DJ Competition! Calling all aspiring, new and up-and-coming DJs! If you’ve dreamed of nothing but to perform and share your music for a crowd, then this may be your chance to do just that. Come show off your talents at the Future Sound DJ Competition and you could possibly land yourself a 2 month residency at Corbu Lounge. The lucky winner will receive a two month residency at Corbu, one ticket to Tritonal’s sold out show on October 9th and a meet and greet with Tritonal! !